The funniest thing is, a quesadilla is basically a Mexican cheese toastie. But they’re the coolest cheese toasties ever (maybe even cooler than my epic cheese toastie recipe which I’ll share soon). These are the sorts of cheese toastie that make people say, “Wow Becky, these are amazing” (genuine quote). So yeah, the other day I had a cheese toastie dinner party. I’ll be honest, I usually get the Old El Paso packs, but I figured I’d make everything from scratch seeing as I was going to be blogging about it. Start with the salsa. The longer and slower you cook your salsa, the better it tastes. You can do this a day or two in advance if you like, just keep chilled until you want to serve it. When I made the salad, I was half intending to fry the ingredients and put them in the quesadillas, but ended up leaving it as a side. Hence the lack of salad leaf – I’d recommend baby spinach or rocket if you did want to add one. You’ll know better than me how spicy you want this. 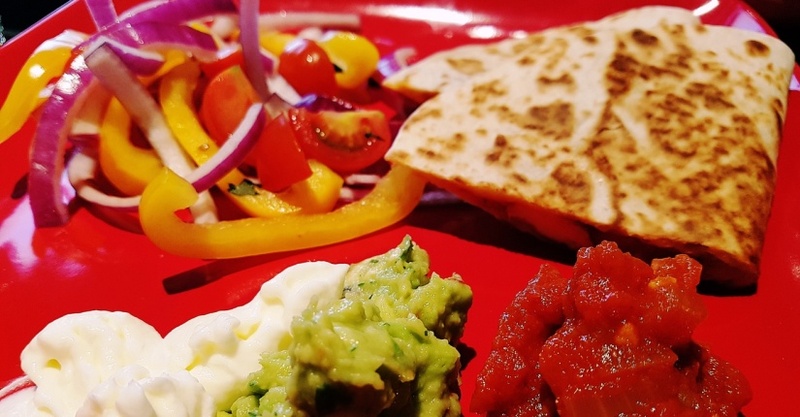 I left the chilli seeds in for the salsa and took them out for the guacamole, and neither were overly spicy, but feel free to leave in for both, take out for both, use less chillies, use more chillies… it’s your tastebuds! When you’re assembling the tortillas, it’s important to get the temperature of the oil right. Ideally the bottom of the tortilla should be golden just as you finish adding the filling, so you can turn it over straight away. Tip – if the tortilla sizzles as you put it in, you’re either using too much oil or it’s too hot! Chop your onion, garlic and chillies finely. Soften gently in some olive oil in a saucepan. When they’re nice and soft, pour in your two tins of chopped tomatoes. Add cayenne pepper and cumin (as much as you like) and then turn the heat right down. Reduce your salsa slowly. Slooooowly. I love my salsa really thick (all the better to scoop up with quesadillas) but you can leave it a bit wet if you prefer. Pop into a bowl and set aside. Chop the onion roughly. Chop the peppers into strips. Chop the tomatoes into quarters. Place in a bowl. Squeeze the lime juice over the top and then sprinkle on some coriander. Toss to combine. Set aside. Chop the chillies and the coriander finely. Place in a bowl. Peel the avocados and discard the stones. Place in the bowl with the chillies and coriander, and mash roughly with a fork – don’t worry about getting all the lumps out. Sprinkle some salt in and squeeze in the lime juice. Stir thoroughly to combine. Set aside. Chop the chicken into small strips. Heat some oil in a frying pan, then place the chicken in. Fry until chicken is sealed all over. Sprinkle in the salt, pepper, cumin and cayenne pepper. Fry until golden all over. Sprinkle chopped coriander over the top. Set aside. Now we’re ready to combine! Heat a small amount of oil gently in a frying pan. Place one tortilla in the pan. Now we have to work quickly! Sprinkle grated cheese over the bottom half of the tortilla. Place strips of chicken on top, then spread over some salsa. Finally, sprinkle some more cheese over the top. Fold over the top half of the tortilla, sandwiching the filling in between. After a minute or two, turn the torilla over using a fish slice (turning around the closed edge). Fry both sides until they’re beautifully deliciously golden. When done, transfer it onto a plate and cut in half. Repeat for all your tortillas. Work quickly so the first few don’t get cold! Serve up to the table with sour cream, guacamole and salsa, and the salad of course. Dig in with fingers (or knives and forks if you’re classy). And that is how you make a cheese toastie suitable for a dinner party! OM NOM NOM!